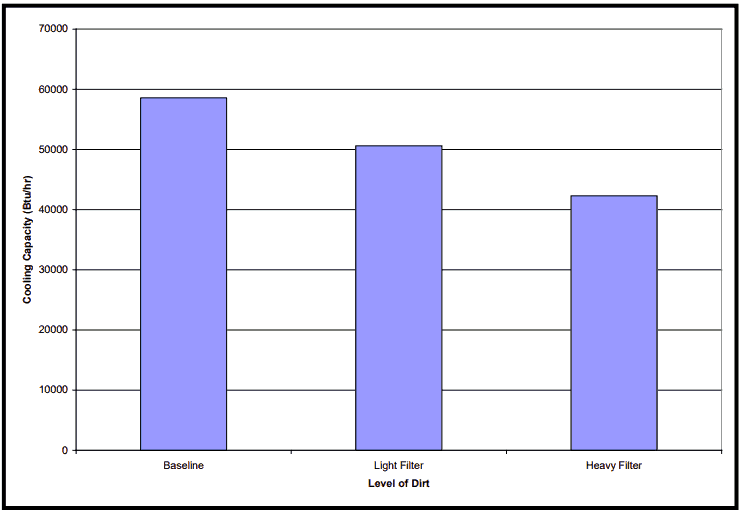 The air filter may be located inside your air handler, as a wall panel or as a ceiling panel. A dirty air filter may result in restricted evaporator air flow, causing your system to operate at less than optimal operating efficiency, wasting energy and delivering poor results. See the following for a detailed explanation of “restricted evaporator airflow“. 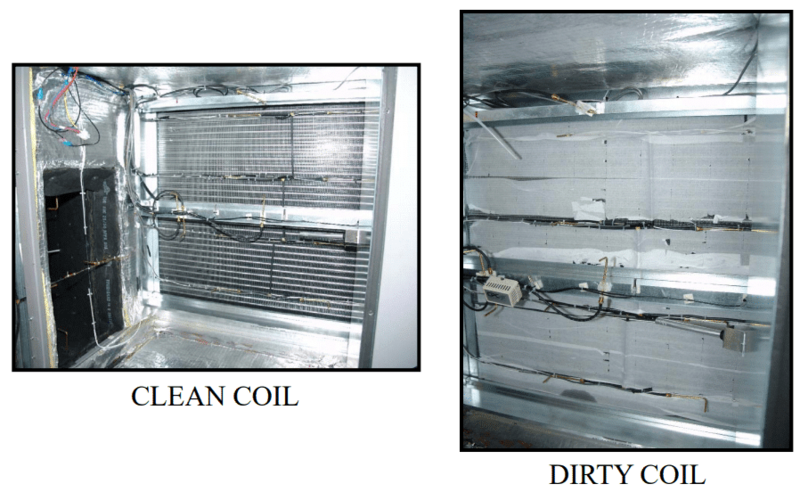 The evaporator coil is located inside the fan coil/air handler (inside your home – see graphic above). A refrigerant liquid passes through the evaporator coil, absorbing heat and moisture from the inside air as it evaporates from the coil. The air filter will remove most airborne dust particles but some will inevitably settle on the evaporator coils. 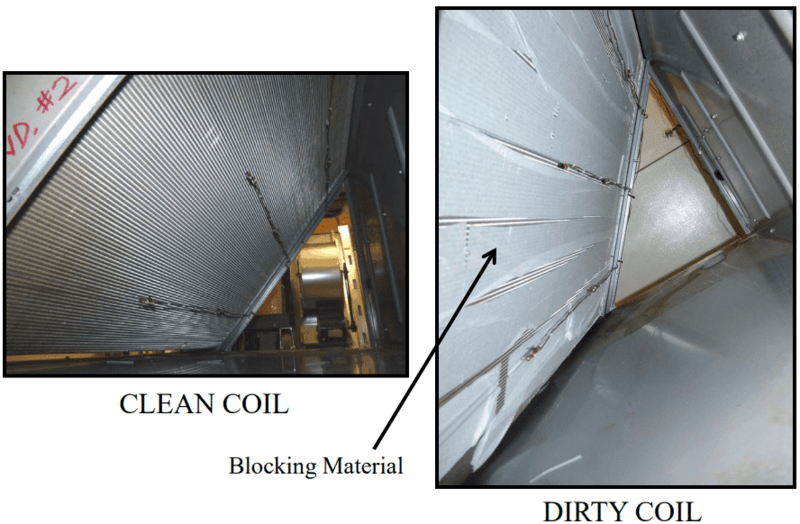 When these coils become covered with dust, this process of heat and moisture absorption is restricted. This is why it’s necessary to periodically clean the evaporator coils. 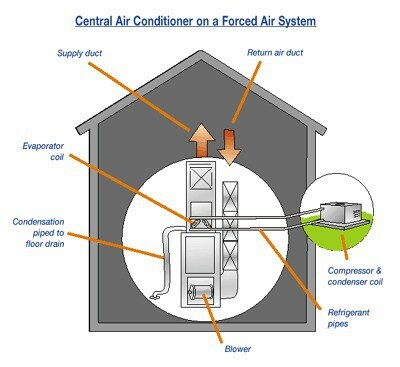 The condenser coils are located inside the condenser (outside your home). Keep them clean and if any “fin type” coils are bent, straighten with a “fin comb”. The condenser coils work in reverse to the evaporator coils. As the refrigerant passes through the condenser coils, it evaporates, releasing the captured air to the outside. When the coils become covered with dirt, dust or debris, this process of heat release is inhibited. 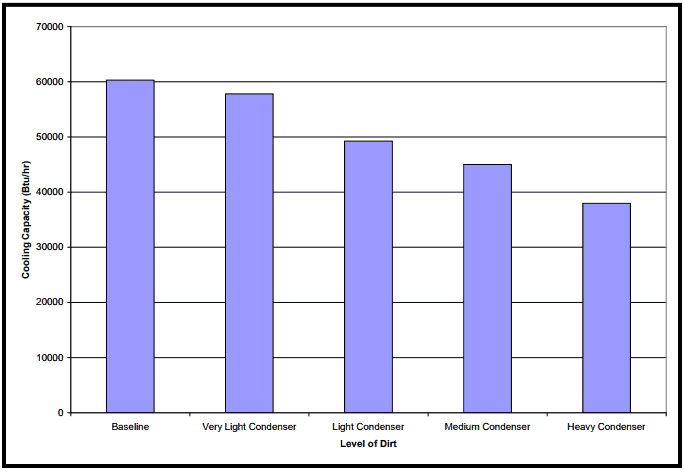 This results in reduced system efficiency, higher energy bills and possible failure of the compressor motor due to overheating. This is why it’s necessary to periodically clean your condenser coils. If your condenser coils are of the fin type, it’s important to keep these fins straight to allow for maximum surface heat release. Over time these fins may become bent so it becomes necessary to carefully comb them straight again using a “fin comb”, specially designed for this potentially tedious chore. Clean debris around unit and ensure a minimum 2ft. clearance from surrounding foliage. 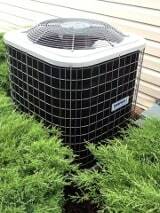 Maintain a distance from the house to the condenser recommended by your systems manufacturer. Failure to maintain good airflow around and through your condenser can lead to overheating and possible compressor failure. If your system has an air handler inside, there is normally a drain pan located beneath the unit. If condensation from the evaporator coils accumulates in the drain pan, this will increase indoor humidity and can encourage mold and algae to grow. A blockage that prevents water buildup from draining can lead to water damage. Therefore, it’s advised to periodically check the drain pan for proper drainage, leaving no standing water in the pan. Also, check the condensate (drain) line to ensure that any moisture is being properly drained from the pan to the outside. If the condensate line becomes clogged, turn off the power at the thermostat as well as the breaker and use a wet/dry vac if possible to remove the blockage. Flush the drain with a with a water/vinegar solution to make sure water is flowing freely from the drain pan to outside. Inspect the ductwork for your hvac system and seal as necessary. Make sure ductwork is straight, with no sags or kinks which could impede air flow. With system on and the blower running, manually run your hand along the ductwork, feeling for any escaping air. You can also use a “smoke pencil” to help spot air movement. 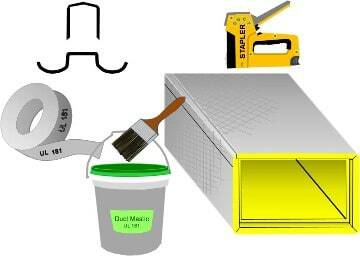 Seal all leaks with duct mastic tape (not duct tape) and/or duct mastic sealant, then recheck. It’s surprising common to find leaky duct work and this can make a dramatic difference in your systems efficiency as well as your utility bill! Research from DOE found that in older homes, the HVAC duct work leaks 30-40 percent of the air traveling through ducts! But just because your home may be newer, don’t assume you have no leaks. 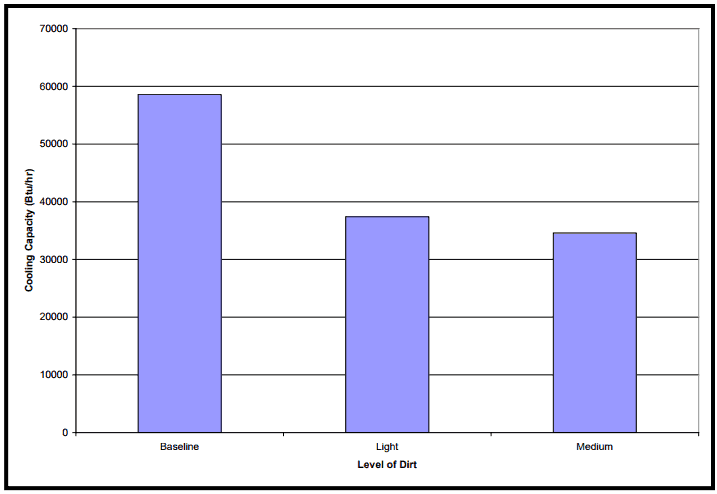 Workmanship varies greatly from contractor to contractor and building codes vary by location. Sealing up registers and vents, then using a duct blaster to pressurize the system and measure the air leakage is considered the most accurate way to test for duct leakage. Make HVAC maintenance a priority to ensure maximum comfort for your home and maximum efficiency to reduce operating costs.